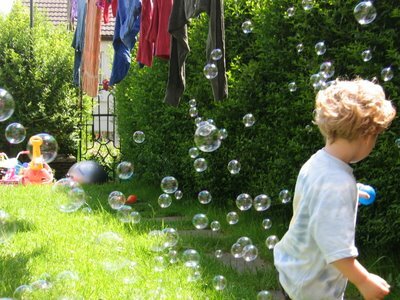 a garden full of bubbles and a line full of washing. today has been so lovely and sunny, we have all enjoyed it. apart from pickle perhaps, who is still feeling miserable, this I deduct from her terrible crossness all day. she isnt so hot today though, thankfully, and still spotless, fingers crossed. love this snap! so cheerful!